As homeowners, we take a lot of steps to fireproof the interior of our homes. But, when it comes to the exterior of our homes, the risk is out of our control. It can come from nearby wild fires, lightning strikes, or unfortunate fires at our neighbor’s homes. Metal roofs are non combustible and can offer some of the best available protection from external fires. And, unlike some other roofing materials, they offer this protection without any special fire resistive treatments which tend to wash away after a few years of exposure to the weather. Additionally, in the event of an interior fire, the low weight of metal is of great significance. Heavier roofing materials increase the chance of a roof caving in once the fire reaches the attic. In fact, with some heavy roofing materials such as clay and concrete tile, fire fighters will not even go inside to fight the fire due to the risk. 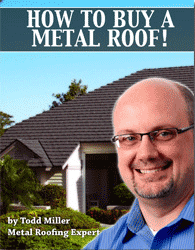 A combustion resistant metal roof can bring great protection to your home and great peace of mind to you. Can you comment on the relative comparative advantages and disadvantages between aluminum, standard steel, stainless steel, and other more exotic metals for roofs relative to specifically fire. Someone I spoke with seemed to think steel was superior to steel in a fire because the aluminum will melt while the steel is still strong and resistant to the flames. Your comment was cut off after this phrase, “…essentially the same in that regard. I…”, could you post the rest? Can you also describe the fire resistant underlayment and give some specific products so I can research this. Do you happen to know which roofs (aluminum or steel) firefighters prefer? Finally, I have heard recently about light-weight roofing tiles Can you share about them and how they compare with metal roofs, especially aluminum? A part of fire fighting training is how to cut through various roofing materials. Most metal roofs are fairly easy to open up in this event. Of course, lighter gauge products as well as aluminum products and also products with a lot of interlocks or overlaps are easiest.